For more than 60 years, TEC Electric has been a premier electrical supply and lighting center for Jonesboro and the surrounding area. 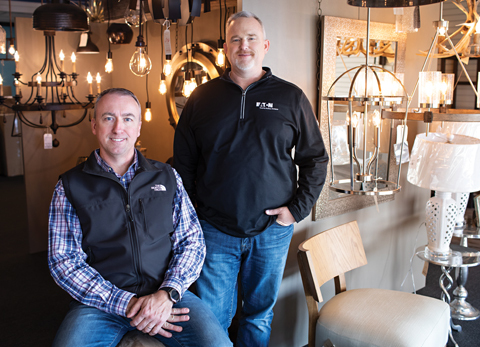 As Lonnie Roberts and Kevin Green take the reins of the local business, they hope to continue the tradition of providing quality service to their longtime customers while continuing to grow and bring in new customers. TEC Electric got its start in the mid-1950s when father and son duo Harold and Jerry Hodges opened an appliance store in Downtown Jonesboro called Home Electric. After expanding to also sell miscellaneous electrical parts, they moved the store to its current Jonesboro location at 1900 South Church St. in 1973. Keith Felkins bought the business in 1984 and changed the name to TEC Electric, which stands for The Electric Connection. Then, in 1991, Felkins opened a second location in Maumelle; he ran both locations until January of this year, which is when he sold the longtime electrical supply and lighting center to childhood friends and new business partners Roberts and Green. Roberts says he has been walking through the doors of TEC Electric for 35 years. Roberts’ relationship with his fellow CEO began in childhood, as well. The two met in third grade when Green’s family moved to the Jonesboro School District, and they ended up living a quarter of a mile apart from each other. Roberts and Green officially took over TEC Electric on Jan. 1, 2018. They say that although working together is new, as is their interaction with the Maumelle location, the transition was a smooth one because of the quality business that Felkins ran for so many years. The business works with everyone from electrical contactors to homeowners to local businesses. The Jonesboro location features a 3,500-square-foot lighting showroom, while the Maumelle location, a 14,000-square-foot building, features 7,500 square feet of showroom space and stores much of the business’ inventory, which is shared between the two stores and the 24 employees. Popular lighting brands that TEC Electric carries include WAC, Minka, Hinkley, Juno and Progress Lighting, and on the electrical side, the business is an Eaton distributor and carries Leviton, Lutron, Emerson Fans and many others. In light of the holidays, Roberts and Green wanted to remind their customers and others in the Jonesboro area that TEC Electric offers a wide variety of timers for interior and exterior lights, as well as exterior plug-ins or receptacles and weather-proof receptacles for repairs. Green says they are thankful for the continued support from the Jonesboro community, which has allowed the store to be in continuous operation for more than six decades. “We invest in local people and local contractors,” said Green, who has also owned Paragould Electric since 1994. “(The support) has been really good. We have a great relationship with many homebuilders and most electrical contractors. For more information about TEC Electric’s Jonesboro location, open Monday through Friday from 7:30 a.m. to 5 p.m. and Saturday from 9 a.m. to 2 p.m., call (870) 932-7252 or visit tecelectric.com.